MINUTES OF A MEETING of the Board of Directors of the Corporation (the “Board’) held on the 12th day of April, 2017 at 7:00 p.m. at Colab in San Diego, California. President Jemmott called the regular Board meeting to order at 6:59 PM. ON MOTION DULY MADE BY STEPHANIE CUCURULLO, SECONDED AND CARRIED, IT WAS RESOLVED THAT the minutes of the meeting of the Board held on 3/22/17 be approved. Completed Art Grant Agreements for 3 recipients; processed sign documents, etc. ON MOTION DULY MADE BY KEN SIMMONS, SECONDED AND CARRIED, IT WAS RESOLVED THAT proposed “undersold” budget is approved as the budget for YOUtopia 2017. ON MOTION DULY MADE BY KEN SIMMONS, SECONDED AND CARRIED, IT WAS RESOLVED THAT the Board grant $8,000.00 to The Journey subject to the artist bringing the art piece to Burning Man, YOUtopia and creating a write up for the sdcap.org website and provide ongoing updates as The Journey attends various events. There being no further business, ON MOTION DULY MADE, SECONDED AND CARRIED, the meeting was adjourned at 9:20 PM. MINUTES OF A MEETING of the Board of Directors of the Corporation (the “Board’) held on the 22nd day of March, 2017 at 7:00 p.m. at Colab in San Diego, California. ON MOTION DULY MADE BY STEPHANIE CUCURULLO, SECONDED AND CARRIED, IT WAS RESOLVED THAT the minutes of the meeting of the Board held on 3/8/17 be approved. ON MOTION DULY MADE BY COLIN JEMMOTT, SECONDED AND CARRIED, IT WAS RESOLVED THAT the Board grant $1,200 to La Santisima Muerte subject to the artist bringing the art piece to Burning Man and creating a write up for the sdcap.org website. ON MOTION DULY MADE BY PAUL MCCARTHY, SECONDED AND CARRIED, IT WAS RESOLVED THAT the Board grant $1,500 to Multi-Pass subject to the artist bringing the art piece to Lucidity, Figment and YOUtopia and creating a write up for the sdcap.org website. ON MOTION DULY MADE BY KEN SIMMONS, SECONDED AND CARRIED**, IT WAS RESOLVED THAT the Board grant $800 to S.U.G.A.R. subject to the artist bringing the art piece to Burning Man and creating a write up for the sdcap.org website. Art Grants: Cassy to draft contracts for art grant recipients. Draft RFP for additional event sent to Board for review, reminder to review. There being no further business, ON MOTION DULY MADE, SECONDED AND CARRIED, the meeting was adjourned at 9:09 PM. A Phoenix rises from the ashes with the hopes and dreams of the UnGranted Artist. To make collaborative art you need money and sometimes grants-hoped-for are not received. Then the unwelcome ritual of mourning your unrealized visions begins. S.U.G.A.R. pays homage to 3 un-granted regional projects, to all those who have come before and those yet to feel the sting of loss. Its purpose – to give us all a good laugh and encouragement to persist! It all started around November 2016 when we decided to throw away a year of our lives and build large scale art for BM 2017. 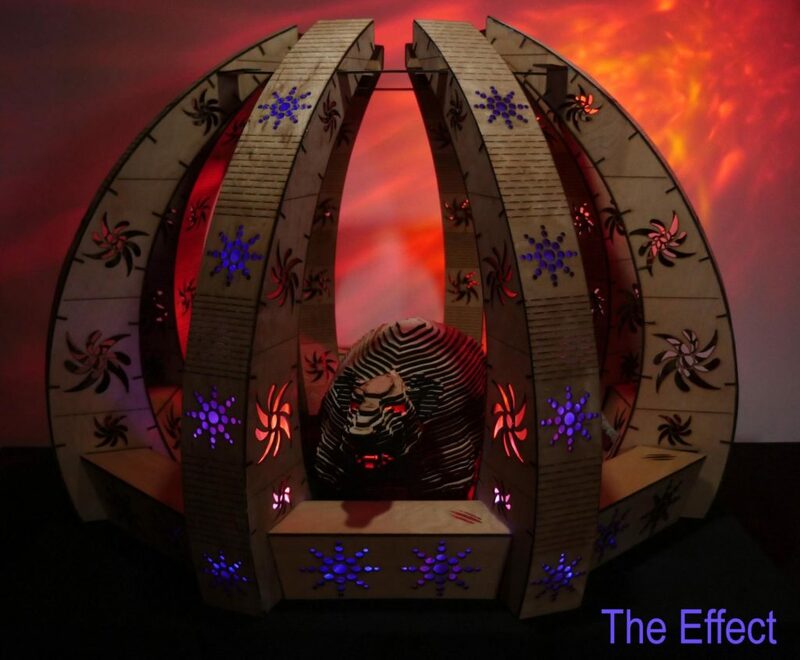 After an exhaustive collaborative process, what we created came to be known as The Effect. We applied for an Honoraria Grant from BMORG, but were turned down for what was half of our $26K budget. We didn’t see a manageable path to fundraising the entire amount in the time available, so The Effect was tabled, perhaps to be revisited at another time. One of the leads on the project had never really considered herself an artist, but was feeling a major sense of loss – grief even – around the decision to let the project go. She felt as if she’d lost a dear friend and wondered how she would ever be able to share the complex set of “truths” – thoughts, experiences, learnings and feelings the project held for her. That’s when she KNEW… I AM an artist! 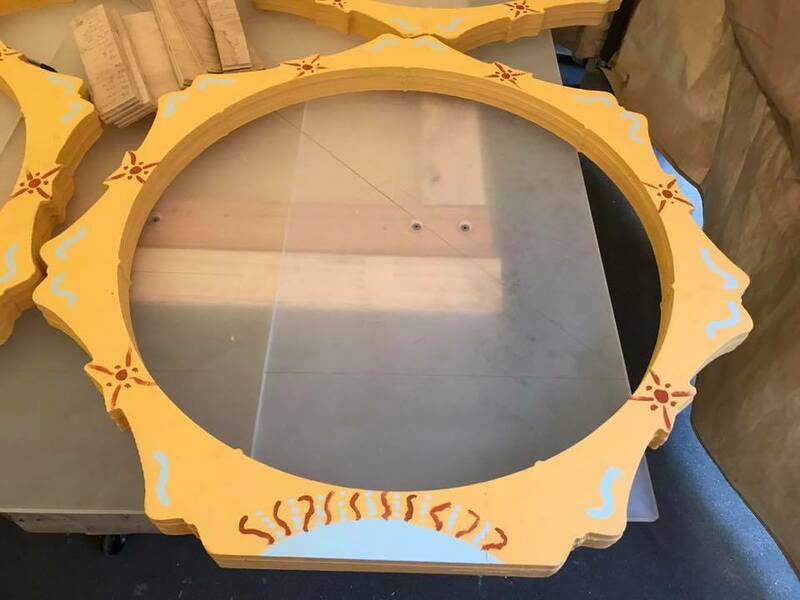 So in a cathartic attempt to come to terms with all of our loss we started to scale the piece down to the BMorg specs for shrines to be placed in the pavilion around the Man. The process was amazing – we laughed, we cried, we submitted it for approval. We were once again denied and – on principle – we get it – heck, we called it UnGranted right in the name. 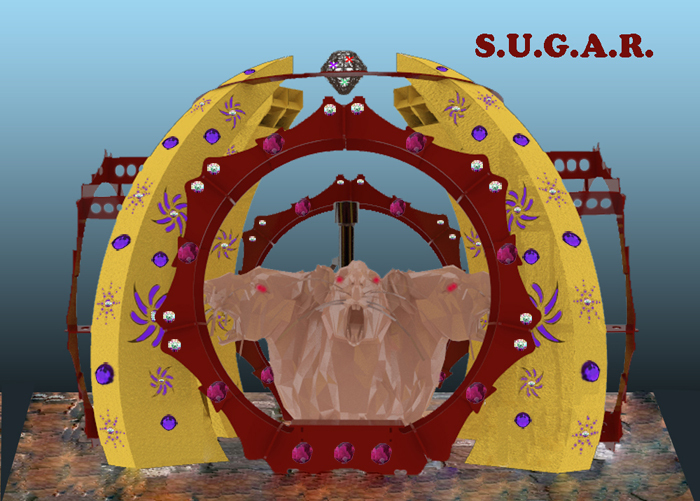 But, with the BM gods repeatedly telling us “no” we defiantly stuck our collective finger in the air and decided we had had enough – no matter what – S.U.G.A.R. 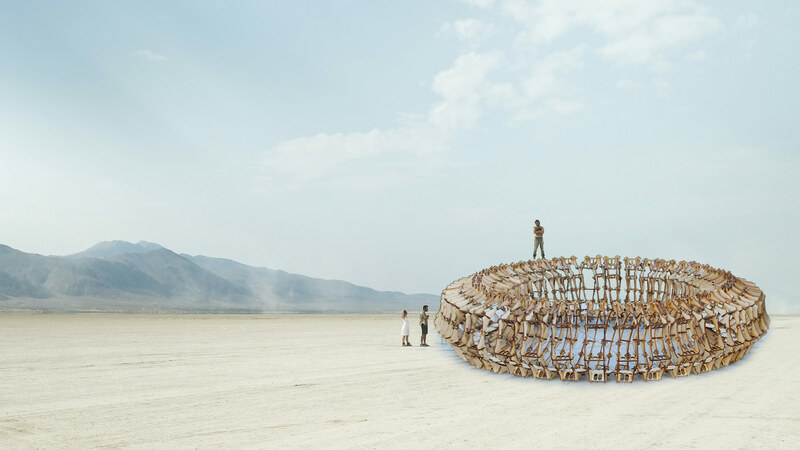 was going to Burning Man! As soon as the decision to create S.U.G.A.R. happened the team jumped into action – designing, programming files, creating 3D art and, most importantly, asking the community for help – which as usual was granted in abundance! Much of what we’ve pulled together has come from so many different sources that all you can feel is hopeful – collaborative art really does bring out the best in all of us (and then it goes south, but that’s another story). 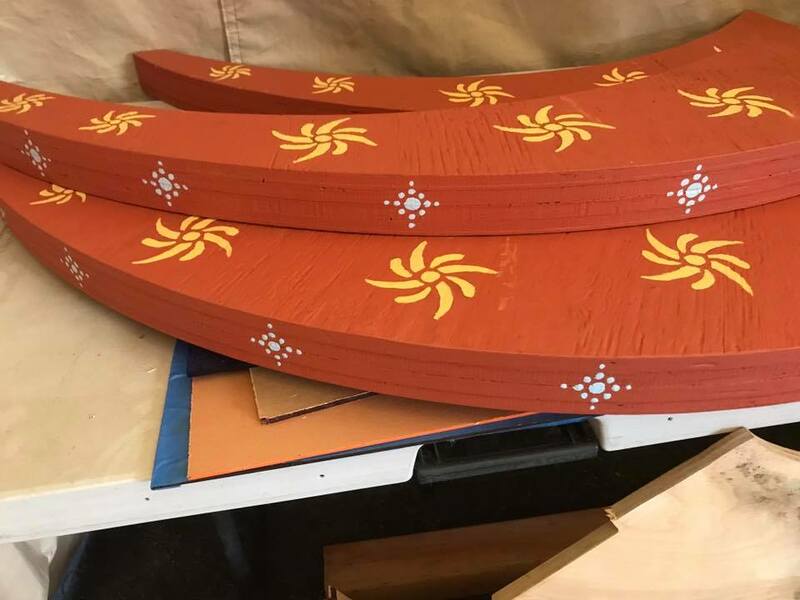 So many have participated in the designing, cutting, sanding, painting, engineering, gifting etc – thank you, thank you, thank you! Pink Heart has gifted us with placement, the use of their power and all the love we need to keep going. 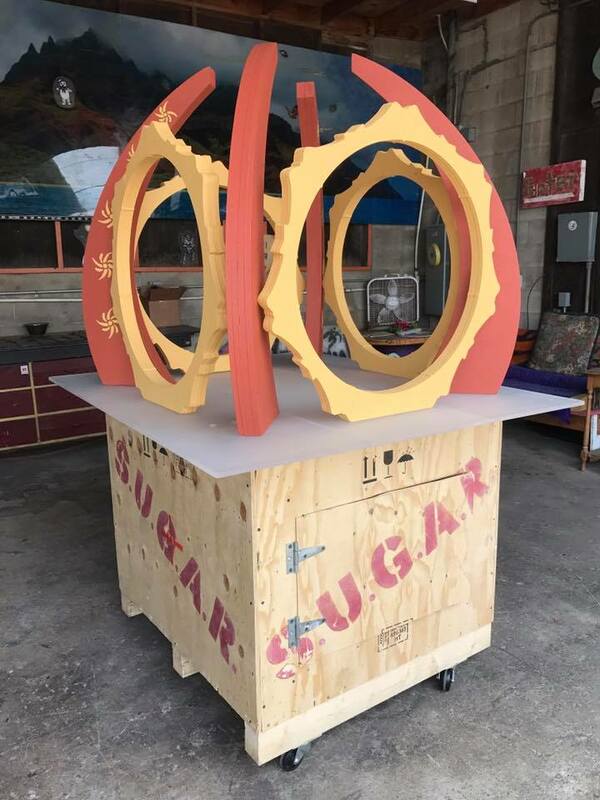 We can’t say enough about CoLab which has gifted us build space, the use of amazing equipment like the laser cutter and CNC router and access to all the knowledgeable people who teach how to make it all go. Special thanks to Ramiro, Melissa, Jake, Ken, Erin, Dan, Kristin, Denise, Meg, Brooke and many others! Here’s the thing, the shrine hosts the turmoil of the ungranted artist and encourages looking past the despair. This is a piece dedicated to moving on in spite of the resistance – going around obstacles or plowing through them. It’s simply about not giving up. Look for S.U.G.A.R. in front of Pink Heart on the Esplanade at Burning Man and near center camp at YOUtopia.